The Professional .NET Subscription is available for WinForms, WPF and ASP.NET editions. It provides valuable additions to build professional SQL query building environment. The Source Code of Active Query Builder for .NET is a separate purchase option for the Professional subscription. The interface consisting of separate visual controls to customize the query building module. Support for DevExpress DXperience controls with skins and custom color themes. Separate SQL Text Editor with code completion and syntax highlighting. Multiline and inline editor for SQL expressions with code completion and syntax highlighting embedded in the UI. The Reusable Queries snippet to organize queries and reuse them in subsequent queries as views. Ready-to-use forms to edit all the component properties, by groups. The ability to mark objects as favorites in the Database Schema Tree. The detailed database object information panel in the Database Schema Tree. The Metadata Loading Wizard to let users load metadata from a database in a few simple steps. The Metadata Filter Editor control. The demo version includes the the Standard and Professional Full-featured demo projects to test the experience the user gets working with both editions. Experienced query writers won't usually need a visual query builder to write a query. They can use it to represent a query visually to understand its structure. For such users, a powerful text editor is of high importance. 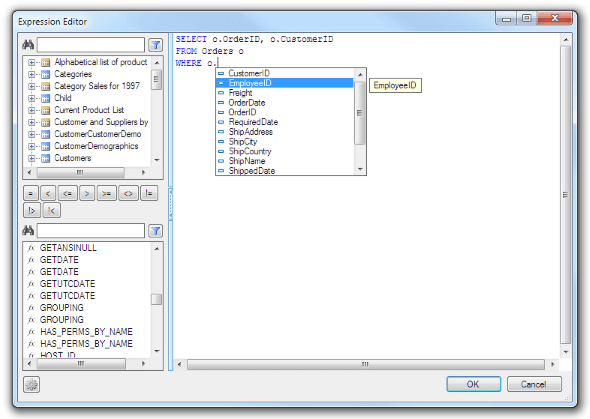 The Professional version of Active Query Builder includes SQL text editor with such essential features as code completion and syntax highlight. It uses Active Query Builder's parsing engine to determine the current context and display the proper completion lists. Easy access to the list of database server keywords, operators and functions. Easy access to the database schema information. Code completion and context-sensitive suggestion lists. The same editor can be used in the visual user interface to build complex SQL expressions and criteria. It can be accessed by clicking the ellipsis button in the appropriate query columns grid cells to edit their values using the fully functional text editor instead of the in-cell editor. Developers building professional software with DevExpress controls can use the component version constructed entirely with the DXperience WinForms controls perfectly matching the component look with the rest of your application. Note: We do not ship the DevExpress controls along with the Active Query Builder. A license for DevExpress DXperience WinForms controls is required to use this version of UI. Active Query Builder itself does not use any third party proprietary or open-source code. It is entirely written in C# and does not require any third-party assemblies to work. Thus, it can be compiled from sources without the need of any additional libraries. The Professional .NET Subscription may be optionally purchased with the full source code, which allows for implementing the custom modifications needed in rare cases. Full source code may also serve as an additional warranty for the independence of your project from force majeure.